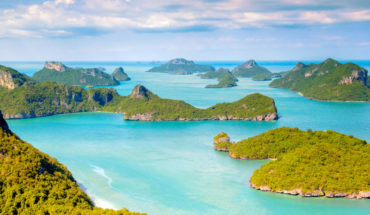 Koh Samui and it’s relaxed atmosphere is one of the more family-friendly vacation spots in Thailand. It’s a great place for kids to go swimming at calm beaches, experience Thai culture and participate in lots of fun activities that children are sure to love. Plus, a well-planned vacation will also allow some time for parents to relax and enjoy themselves as well! 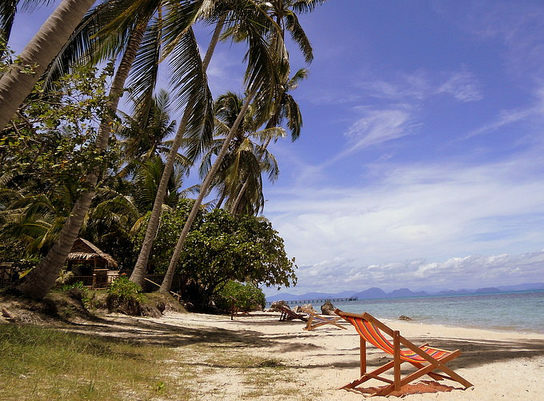 Below is our top 7 family-friendly beaches in Koh Samui. 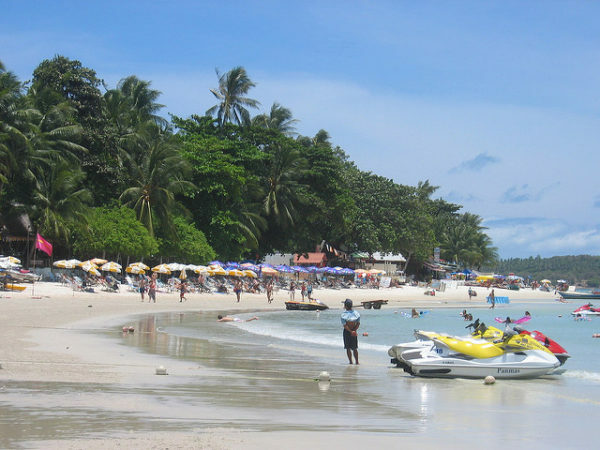 Chaweng is the most developed and more populated areas on Koh Samui island. Therefore it offers the widest choice of restaurants, shops and leisure activities for families to enjoy. The beach itself is almost seven kilometres in length so there is plenty of room for you and your family to find your own space. There are also lifeguards posted at several locations along the sand to keep everybody safe in the water. Check out where to stay in Chaweng. Samui Aquapark (located approximately 40 metres off the sand in front of Monkey Bay Bar) has large inflatable and challenging water activities for the whole family to enjoy. Snorkelling, kayaking, stand-up-paddle boarding, jet ski hire and para-sailing available. Seaside dining and cocktail bars are available at one of the many beachfront restaurants located along the sand. Central Festival (the only large shopping mall on Koh Samui) is open 7 days a week for you to purchase food supplies and anything else you may need. 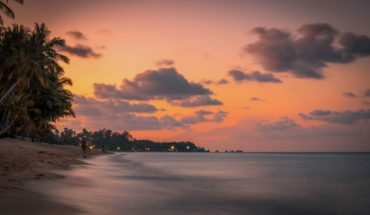 Lipa Noi is a lot quieter than the bustling shoreline of Chaweng beach — which makes it a great spot for families who want to ‘chill-out’ away from the busy crowds. The beach still has plenty of activities and beachfront restaurants to enjoy, with fine white sand and no rocks or coral out in the water. And the water level is typically very shallow for up to 100 metres out to sea, making it one of the safest beaches for young children to play in the water. Check out where to stay in Lipa Noi. Learn to sail at Le Beach Club Samui. Take a trip to nearby Wat Samut Tharam Buddhist Temple. Wade around in the water while enjoying a picturesque sunset. Spend the day at Nikki Beach Club to indulge in poolside cocktails, international delicacies and live music. Taling Ngam is another peaceful beach located on the Southwest corner of the island with stunning views of the Angthong Marine National Marine Park. The jungle closely hugs the white sand shoreline and makes for a picturesque setting to enjoy a day at the beach with the family. The water is nearly always calm with clear light blue tones. The water level here is particularly shallow making it a great place for snorkelling and another safe beach for the kids to enjoy playtime in the ocean. See our villas in Taling Ngam here. Go snorkelling and explore the pristine shallow waters. Hire a canoe to visit one of the smaller islands located just offshore from the beach. Take a private long-tail boat to go sightseeing around the beautiful Angthong Marine National Marine Park. Visit the nearby Butterfly Park & Insect Kingdom located a short drive inland. 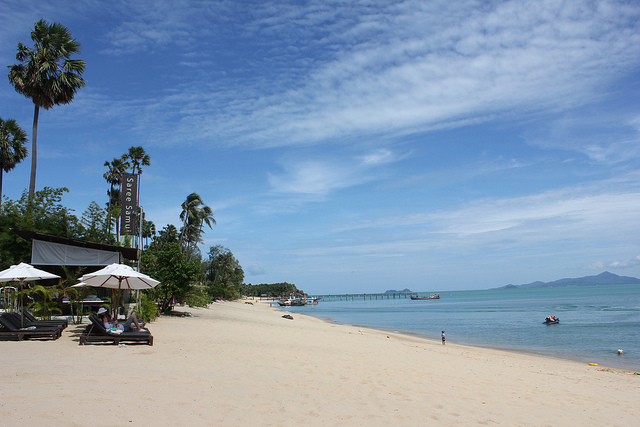 Maenam beach is a long stretch of sand located at the Northern tip of Koh Samui island. It tends to be a quieter beach than busy Chaweng, with fewer beach vendors and activities on offer. However, this also means there is more room to move around, find your own spot and relax with the family. There are still several restaurants, bungalows and beach umbrellas lining the beach for you to enjoy. Plus there is a great selection of dining and shopping options located along Maenam walking street in the main town. 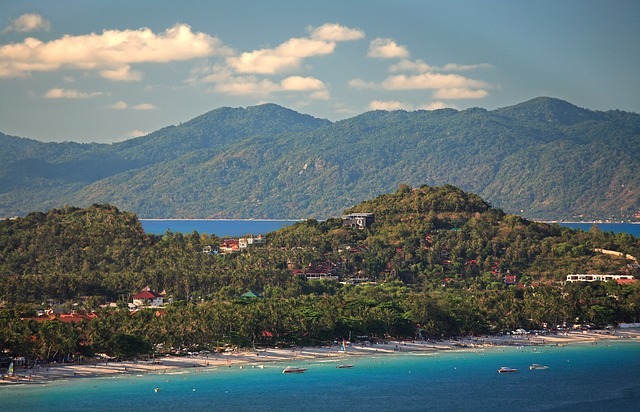 See our villas in Maenam here. Take a walk along the long beach and set up in your own private area for the day under the shade of one of the many palm trees which hug the shoreline. Hire a local instructor from Koh Samui Kite Boarding (KSK) located in Maenam town and learn how to kite-surf (or kite-board). Take a stroll down Maenam walking street for a wide selection of dining and shopping options (Maenam night market is every Thursday evening starting at 5:00pm). Visit the nearby Pink Elephant Water Park for a fun day of water slides and other fun activities. Choeng Mon is only about 15 minutes north of Chaweng and about 5 minutes away from Big Buddha. The area is made up of a series of bays featuring a peaceful atmosphere, pristine tropical water and a number of secluded white sandy beaches. 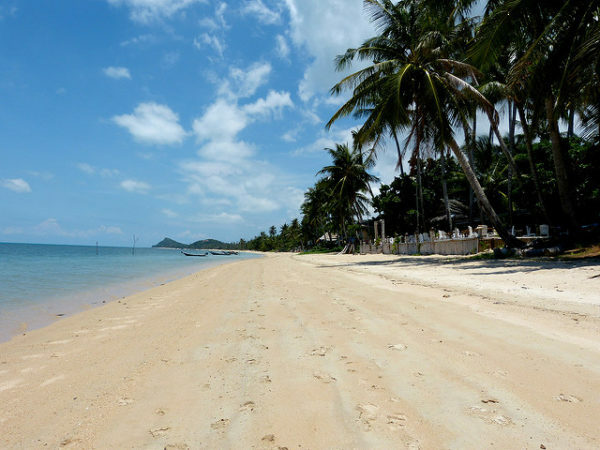 It’s one of the best family-friendly beaches in Koh Samui as there is a variety of different fun and leisure activities for everybody to enjoy. Treat yourself to a chilled coconut and a traditional Thai massage from a friendly local under the shade of a beach umbrella. Or hire a canoe to go snorkelling with the kids around the bay. Enjoy a delicious breakfast, lunch or dinner at one of the many beachfront restaurants located right there on the shoreline. Activities such as Jet Ski hire, Banana boat rides and canoes are available from local vendors up and down the beach. 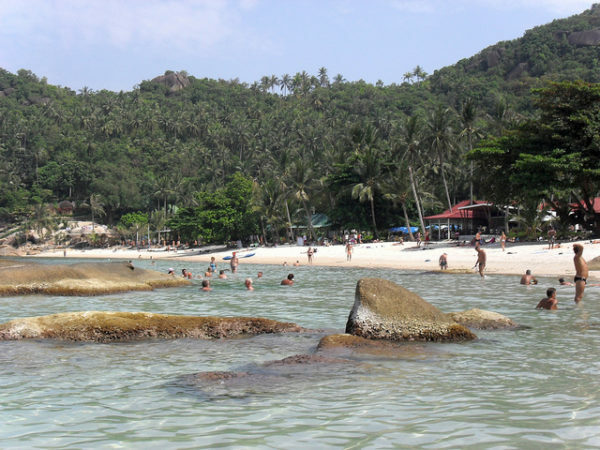 Take a short walk through the ocean over to the small island of Koh Fan Noi which is easily accessible at low-tide. Drive 5 mins inland to visit the popular tourist spot of the Big Buddha Temple. 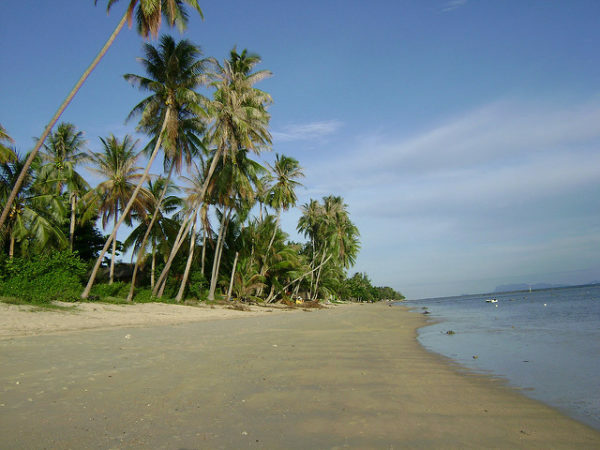 Bang Po (Bang Por) beach is a quiet stretch of sand located up in the North Western part of the island. This beach has the classic tropical paradise feel to it, with less tourist crowds and beautiful swaying coconut palm trees overhanging the shoreline. There is a small strip of reef which runs parallel to the beach, creating shallow waters for swimming (ideal for small children) and a great place to go snorkelling for the more adventurous. There is also little pollution to worry about in this sparsely populated area of the island, which means the water quality is nearly always pristine. Check out where to stay in Bang Po. Enjoy some of the freshest seafood Koh Samui has to offer at one of the many seafood restaurants located in the area. Hire a comfortable beach chair with sun umbrella from one of the local vendors and indulge in some tasty cocktails prepared for you right there at the beach while the kids play in the shallow waters nearby. Take a short trip inland to participate in a variety of fun activities such as Frisbee Golf and Zip lining through the tree-tops of the nearby jungle. 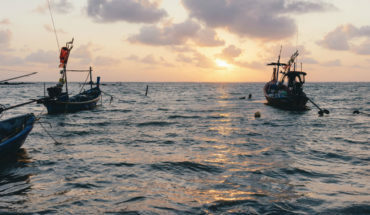 Hire a traditional Thai long-tail boat and driver to explore the local area and go snorkelling at the nearby reef. Silver Beach (also known as Haad Thong Ta-khian) is a peaceful paradise getaway just north of the much busier tourist spot of Lamai Beach. The beach itself is reasonably small (only about 250 meters in length) but still has plenty of room to move and activities for the whole family to enjoy. The area offers a nice selection of beachfront restaurants, natural shade under trees, beach umbrellas for hire and excellent snorkelling opportunities along the rocks at both ends of the beach. The shallow shoreline also provides a safe place for kids to enjoy the water. Beachfront restaurants offer a wide selection of both ‘western’ and traditional style foods as well as cocktails and drinks. Sea kayaks and snorkel gear are available for rent from a number of locations along the beach so you can explore the local area and underwater sea-life. Traditional Thai massages, relaxation treatments and manicures/pedicures are available under the shade of the trees along the sandy shoreline. Take a short trip over to the busier tourist spots of Lamai and Chaweng to go shopping and feast on traditional Thai street-food at one of the many local markets situated in those areas.